A tomo kahni was a winter home, as called by the Kawaiisu Indians. In this particular instance Tomo-Kahni is the winter village of the Kawaiisu. Evidence indicates the village was well populated and inhabited for a very long time. Communal grinding stones, sharpening stones (for awls used in basket-making) and ceremonial caves line the village area. Stone rings for sweathouses near streams, shelters as well as juniper trees growing out of old campfire sites also dot the landscape. Tomo-Kahni is built in a broad, rocky meadow high in the southern-most portion of the Sequoia. 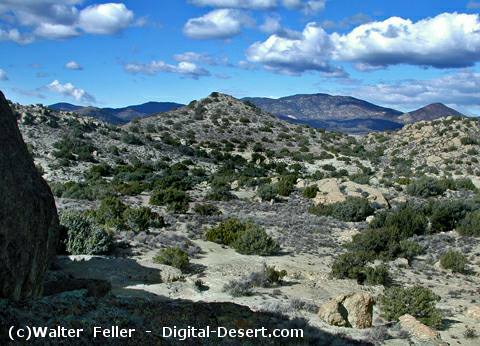 The location provides protection from the winds, and low ridges so observations may be made of those approaching in the wide sandy canyon below. The Kawaiisu were of Shoshonean lineage who spoke the Southern Numic subgroup of the Uto-Aztecan language. Migrating from the Great Basin, they had made the Tehachapi area their home for two to three thousand years. They were a peaceful, gentle people with a great respect for their surroundings, living and working in small family units. Being hunter-gatherers, the Kawaiisu roamed their territory in search of food. They traveled from the valley into the mountains and even the desert to gather supplies for everyday use and to prepare stores for the winter. Young girls learned to gather and prepare food early in life, and the young boys started hunting for the family at about 9 years of age. The very young would play games to sharpen their hunting skills. Dolls were made from clay or small rodent skins with the head attached and stuffed with grass. A game of hide and seek was also very popular. The Kawaiisu are noted for their very finely woven baskets of intricate and colorful design. Girls would learn the complex task of gathering and preparing materials for the beautiful baskets they would make. Boys learned the art of making cordage and creating rabbit skin blankets. Spring was a time for the young men and women of other tribes or families to meet and marry. Birth and death were also times to gather, with feasting and dancing lasting several days. During the winter months the Kawaiisu made the Sand Canyon area their home. Women would work on baskets, and prepare the food. Men would knap arrow points and knife blades from chert and obsidian, straighten arrow shafts from willow branches and prepare the foreshafts for the arrows. Dice games were played by adults. Stories were told usually by an elder in the family and the children would receive very important lessons to be used throughout their lives. They were taught respect for each other, for the land, the plants and for the animals that lived there. The Tomo-Kahni State Historic Park: Kawaiisu Native American Village was created as a unit of California State Parks in 1993 to protect and preserve the integrity of the location. Nestled atop a ridge in the Tehachapi Mountains, overlooking Sand Canyon to the east and the Tehachapi valley to the west, Tomo-Kahni, or "Winter Village," was the site of a Kawaiisu (Nuooah) Village. The location was likely chosen for its moderate temperature and plentiful resources. The Kawaiisu migrated from the Great Basin and made the Tehachapi their home for two to three thousand years. The Kawaiisu are noted for their finely woven baskets of intricate and colorful design. Due to the extremely sensitive nature of the site, Tomo-Kahni is available to the public by tour only. These tours are led by trained State Park Volunteers on weekends during the spring and fall months. The Park may only be visited by guided tour and advance reservations are required. Tours meet at the Tehachapi Museum and the reservation phone number is 661-946-6092. Tours begin with an orientation at the Tehachapi Museum in Tehachapi, CA. After an orientation, participants must caravan or carpool approximately 12 miles to the park (high clearance vehicles are recommended). The moderately strenuous walking tour takes between two to three hours to complete. The overall tour, including orientation and return to the Museum, takes about 4 to 5 hours. The Kawaiisu were of Shoshonean lineage who spoke the Southern Numic subgroup of the Uto-Aztecan language. Migrating from the Great Basin, they had made the Tehachapi area their home for two to three thousand years.